I'd really like to get a gramaphone player but most I've found are either broken and/or very expensive antiques. 1) What do they use to play their discs? Some record players used to have the option of 16, 33, 45 and 78 rpm with a needle that could toggle for the neccessary media, but I doubt these are still made. What I'd really like is a wind-up record player, though I doubt these were ever made at all! But there were some small battery powered record players. 2) How easy would it be to convert a battery powered player to a wind up mechanism? 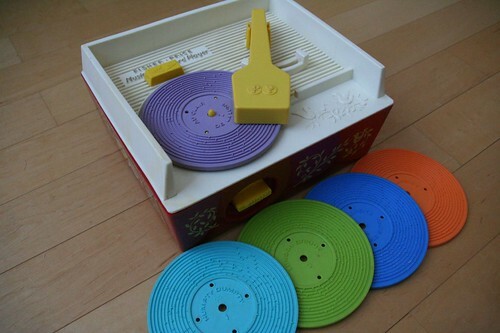 Otherwise I may just have to settle for this wacky fisher price record player! neon_suntan wrote: How easy would it be to convert a battery powered player to a wind up mechanism? How easy do you find it to take things apart? All you'd have to do is replace the electric motor with a wind up one but getting the right RPM might be hard. Perhaps it would be easier to replace the whole mechanism inside an electric record player with a wind up motor of a specific RPM attached directly to the turn-table. What I'd really like is a wind-up record player, though I doubt these were ever made at all! Isn't that pretty much what the old gramophones were? You'd wind it up with that big handle at the side and then it turns the record, wind up! JingleJoe wrote: wind up motor of a specific RPM attached directly to the turn-table. Something like those wind-up radios? The most "portable" gramophones weren't what people consider portable today, they still needed to be set down somewhere to be played and then you had to carry around big records too. You're looking for something thats going to be hard to find. How about a wind-up Mp3 player or media player? The Verio seems good thought the ECO player might be a better long-term investment it's bit on the pricey side! Now where can I get a reasonably priced gramophone? I have a 1930s wind up record player for 78s and it works beautifully. It's fairly heavy, and about the size of a medium typewriter. I'm not sure how the spring keeps such a nice consistent tension through most of the record, but it seems to have a pretty strong push to it. There's definitely a worm screw gearing to the thing. I took it apart somewhat to clean it after I bought it, and there's not much to it. The needle stem is screwed into a little tube in the bottom of a sort of small phone-type speaker piece that probably gives some trebel boost. The speaker piece opens into a series of swiveling tubes (the arm of the record player) that increases in size and finally enter into the base of the device. After the arm enters the device, a pressed cardboard chamber winds around the back of the drive mechanism and finally opens to a primitive soundboard-type speaker on the side of the player opposite the arm/needle device. The increasing chambers sort of resemble an ear canal and ear drum in reverse. It's pretty damn loud too, even without an amplifying horn. If you ever want to see photos, I'd be happy to post some. I can't imagine making the parts by hand unless you are a skilled metal smith. It could be very feasible to do this, but would be pretty time consuming. Special note: They will talk about evolution in the sound clip. If that's not your thing, I apologize. It is not my intent to derail the thread. It is merely my intent to demonstrate what you can do with sound devices. Actually, gramophones are still manufactured in India and the late Soviet Union. About two years ago World Market (a chain of import stores in the US) had Indian-made gramophones for about $80.00, including spare needles and a couple of 78 RPM disks of what could be described as Indian pop music. These were great items. They had the hand-cranked spring mechanism, variable speed control, the hollow tube sound arm, steel needles, and a big tin speaker cone. I'm pretty sure a search of Indian/Asian markets, the odd Chinatown shop, or Eastern European import shops will yield a brand new old time gramophone. I had a hand-cranked Victrola when I was a kid - big floor model. Might still be in Mom's attic, though I gave her permission to sell it years ago. I also had a portable one, much flimsier, and I think it eventually fell apart. At any rate, the speed was controlled by a governor. The console model's speed could actually be adjusted, and I managed to get it down to around 33rpm - and destroyed an LP on it, not realizing at the time that the grooves were MUCH narrower than on a 78 and the weight of the head was several OUNCES as opposed to a few grams! So don't try that at home! Interesting that 78s were still available just a few years back (and maybe still are) in some places. BTW, that toy player in the first post is actually a musicbox, not a phonograph. The "head" contains teeth that are plucked by the bumps on the "records". OldProfessorBear wrote: that toy player in the first post is actually a musicbox, not a phonograph. The "head" contains teeth that are plucked by the bumps on the "records". It's a curious device, it's a music box with interchangeable tunes, I do remember it played "Edelweiss" though. Much more fascinating is the Fisher Price PXL2000 . A great idea of reusing old tech. 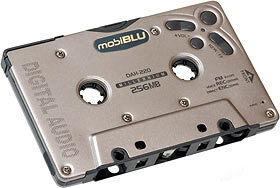 But what about a way to record and play back mp3's from a an actual cassette tape? Just found something made by a company called Gakken - a Gramophone kit! I think you are more likely to actually receive this one, if they want to maintain their rating. I have seen Victrola cases in antique stores before, with all the works removed or non-functional; a handy person with some maker skills could probably put together one of these kits in an original casing, and without misrepresentation make quite a profit. neon_suntan wrote: I'd really like to get a gramaphone player but most I've found are either broken and/or very expensive antiques. *sniff* I remember having one of those! Yeah, it dates me but I don't care!